What are the APA member levels? I’d like to change the APA Member Benefits I’m entitled to receive. How do I upgrade (or downgrade) my membership level? How do I join as a student? Am I a member of my local chapter, and can I receive updates from other chapters? Who is eligible to join APA? Can I pay for my APA membership with a personal or business check? How can I join APA as an Editorial Photographer? Does APA provide International O-1 Letters of No Objection for USA Visas? Does APA still USmail out packets, and when should I expect to receive my APA Member Identification Card? I understand that all APA memberships are considered annual, and dues are nonrefundable. What is APA Auto Renew, and if I have to, how do I cancel it ? I'm a current APA Member and I need to update the credit card I have on file; how do I do that? Can I call you with that confidential info? Is there an updated version of APA National's Business Manual? Does APA offer photo equipment & liability insurance for APA members? What special Member Benefits are reserved exclusively for APA Leader members? Are APA members entitled to discounts on Apple products, and if so, how do members gain access to them? My APA membership lapsed. I’d like to rejoin. Do I need to redo my entire APA Member Profile? Our membership structure gives every photographer, and those affiliated with photography an affordable way to belong to a community of like-minded professionals. Q. What are the APA member levels? View the membership table with Benefits. Or, view the Benefits by Member Levels. Q. I’d like to change the APA Member Benefits I’m entitled to receive. How do I upgrade (or downgrade) my membership level? Membership dues are nonrefundable. However, if you are on our Annual pay plan, and you would like to upgrade, we will pro-rate: refund the balance of your current membership; refunds take 5 to 10 days to appear in customer accounts. We will set it up in your APA Profile so you can login, cancel your current membership, select your new level / pay plan, and checkout. Your Profile will stay intact so you won't have to fill out the registration form again, and you will immediately be able to access your new benefits. Q. How do I join as a student? Your student status will now be captured as an attribute, so you can join or renew at any level. Q. Am I a member of my local chapter, and can I receive updates from other chapters? When you belong to APA, you are automatically affiliated with an APA chapter, based upon the address you list in your Member Profile. This allows you to stay involved at the local level, participate in chapter events and receive communications and invitations. If you move to a different chapter territory, please login and update your address, then send an email to membershiprep@apanational.org requesting a chapter change. More info is here. Q. Who is eligible to join APA? Anyone anywhere can join APA at any member level. Q. Can I pay for my APA membership with a personal or business check? Sorry, no -- we no longer accept checks for dues. It's simpler, more efficient and cost effective to operate the organization through the e-commerce solution built into our website. Q. How can I join APA as an Editorial Photographer? When joining, select any membership plan that suits your needs, from Contributor to Leader, then select Editorial as one of your Photo Specialties. In 1999, a small group of photographers in San Francisco came together to begin sharing information regarding magazine contracts, and general business best-practices. Soon thereafter, the group adopted the name, Editorial Photographers (EP), and an association was born. In 2012, EP merged into American Photographic Artists (APA) to bring a stronger voice to the photography industry and enhance the education and advocacy missions of each. Q. Does APA provide International O-1 Letters of No Objection for USA Visas? IMPORTANT PLEASE NOTE: Annual (not Monthly) Leader or Pro level Membership is required, and there is a one-year minimum. You must join on the annual payment plan to be eligible. APA has a no refund policy. Examples of your photographic work are also required, and upon APA reviewer approval, qualified applicants will receive an official statement denoting photographer with exceptional ability. There is a one-time $100 processing fee for either letter. If you are not yet an APA Professional and Leader member, please wait until after the APA reviewer approval before joining. You must join on the annual payment plan to be eligible. Contact our National Executive Director, Juliette Wolf-Robin (executivedirector@apanational.com) for details. Based upon your address, you will be automatically affiliated with one of our nine chapters (New York, Los Angeles, San Francisco, San Diego, Chicago, Atlanta, Charlotte NC, Washington DC, or Seattle / Northwest). Contact info for our chapters is here. More info about Chapter Affiliation and receiving updates from other chapters, is here. 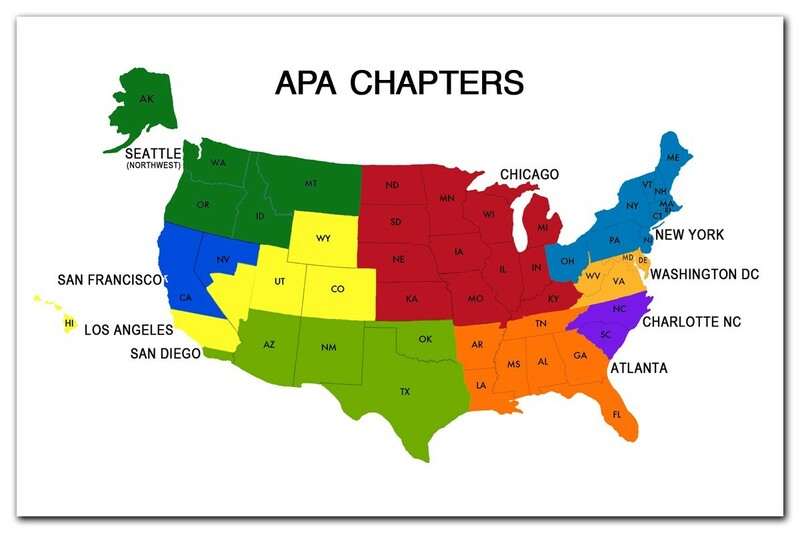 International Members, who reside outside the USA are part of APA National, and are not directly affiliated with one of the nine chapters. Anyone can receive Chapter Event Announcements and other Updates from any APA Chapter; please go here to find out more. For Membership questions, please contact: Jeff Kausch, APA National Membership Representative. Q. Does APA still USmail out packets, and when should I expect to receive my APA Member Identification Card? Almost all of your member benefits are now available online, by simply logging in, so we no longer USmail out new member packets. Your APA Member ID Card will automatically arrive within 4-6 weeks after your join or annual auto-renewal date; please make sure your USPS address is current and complete in your Profile. More details are here. You can also login and scroll to the bottom of your My APA page to print out your temporary APA ID card. Q. I understand that all APA memberships are considered annual, and dues are nonrefundable. What is APA Auto Renew, and if I have to, how do I cancel it ? For your convenience (and, as it states in the required click-through Join page Member terms) APA will continue to auto renew your APA Membership dues subscription until you tell us otherwise. Please verify that your credit card account number and expiration date are current; simply login and click on Edit My Account and / or Update Billing Details (in the right side vertical navigation menu -- the white box with a red stripe on top). A reminder for Annual Renewal charges is sent via email within 30 days prior to renewal. Please keep your email address current. Should you cancel your APA membership, you will be removed from Hire an APA Pro, and the APA Portfolio, and will no longer be entitled to receive membership benefits and discounts. Q. I'm a current APA Member and I need to update the credit card I have on file; how do I do that? Can I call you with that confidential info? For your security, we don't have any direct access to your credit card info, so we can't update it via the phone for you. Simply please login, and in the right side vertical navigational menu (the white rectangle with a red stripe on top) click on Update Billing Details. This will take you to the secure area where you can update your billing info. Q. Is there an updated version of APA National's Business Manual? The newest version of our Business Manual is now available to the public, at no charge, in our Advocacy section, here. Q. Does APA offer photo equipment & liability insurance for APA members? APA has a dedicated business unit to handle our members' insurance needs. It's business insurance designed by photographers for photographers. As the leading not-for-profit organization serving professional photographers we know the unique demands of this industry. Our insurance agents deal with photographers all day long, have loads of experience and are trained problem solvers. They're not afraid to get in the trenches and hammer our the best insurance plan to fit any business need. Plus, APA Insurance Services (AIS) never charges for COI (proof of insurance certificates), unlike many other companies. Get a free no-obligation quote and compare rates today. More info is here. (Please note: Insurance is not included in membership -- it's available to members at the Supporter member level and above, and your rates will depend upon the coverage you need). Q. What special Member Benefits are reserved exclusively for APA Leader members? Leader's Profiles are prominently featured in a rotation, in the top left corner of our APAnational.org homepage. They are also recognized here on our Leaders page. And they receive the highest Awards Entry Fee discount. You can view all of the APA Member levels and the benefits for each one here. Q. Are APA members entitled to discounts on Apple products, and if so, how do members gain access to them? APA Members at the Supporter level and above are entitled to discounts on most Apple products by using the APA Apple Online Store. Simply login to your MY APA page, and in the right side vertical navigation menu, click on Discount Codes, then click on the APA Apple online store link in the alphabetical list. The prices listed in the APA Apple Online Store include the APA member discount. More info is here. Q. My APA membership lapsed. I’d like to rejoin. Do I need to redo my entire APA Member Profile? To rejoin, simply use the Look Up Account feature in the Join section on our site.